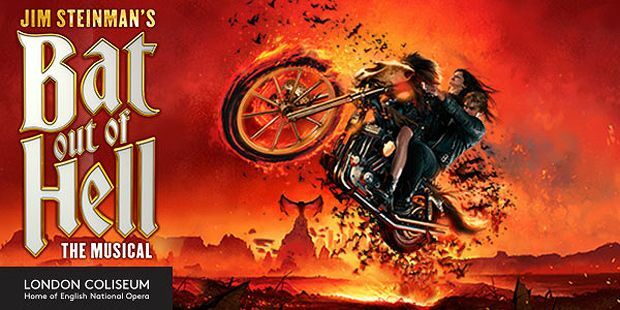 The London Coliseum is set to host Bat out of Hell: The Musical from 5 June to 22 July 2017, with pre-sale tickets available from Thu 13 Oct at 11am. Based on Meat Loaf's legendary album, the musical is written by Jim Steinman and directed by Obie award-winning Jim Scheib. In typically Meat Loafian style, Bat out of Hell: The Musical is a story of teenage angst, lust, and rebellion in a post-cataclysmic city. Featuring more than 20 Steinman songs, the audience follows Strat who falls in love with the daughter of the despotic Falco, and embarks on a romantic, rock'n'roll adventure to win her heart. First released in 1977, Bat out of Hell was Meat Loaf's second album and major-label debut. Over the past 40 years, the record has sold more than 43 million copies worldwide and is one of the best-selling albums in the history of recorded music. Steinman and Meat Loaf returned to the album twice after its original release, creating Bat Out of Hell II: Back into Hell – best known for 'I Would Do Anything for Love (But I Won't Do That)' – and finished the trilogy in 2006 with Bat Out of Hell III: The Monster is Loose. Bat out of Hell: The Musical will also visit Manchester's Opera House from Fri 17 Feb–Sat 8 Apr. Exclusive pre-sale tickets for Bat Out of Hell: The Musical at the London Coliseum on sale from Thu 13 Oct at 11am. General sale tickets from 4 Nov.
Rock'n'roll musical by Jim Steinman based on the Meat Loaf album.